Being raised in an area where there is not very much diversity in race gave me little experience to the massive amount of discrimination and struggle that people go through on a daily basis. I did not know that the Mexican population was such a big issue in today’s society. Before entering this course, I did not know much of anything that was going on in the world of immigration and the Mexican population, especially in Lexington, and did not realize that “new, multicultural tensions have emerged as a topic of concern in the community” (Rich, Brian, & Miranda). Coming into this class, I knew that in my small hometown the Mexican population consisted of the owners and workers at our local Mexican restaurant. I had no idea what these people went through to get here and how hard life was just living here, even though it is much better than being in Mexico. This course allowed me to expand my knowledge and find out what is really happening in our country at this very moment. First of all, I did not realize that most Mexican people in the United States live in fear of being deported everyday of their lives. I honestly had no idea that “detained” was even a word more than less that there are detainment centers for undocumented Immigrants. The fact that people go to jail just for living their lives in the United States caught me completely off guard. I realized that some people get deployed if they do not have the right documentation but I did not know that there were specific jails that they were held in. The people who are held here are mothers, fathers, or even children who are just trying to live their lives in the United States of America but are put through a ridiculous amount of discrimination while trying to do what everyone else does. The picture below shows how bad the working conditions are for Mexican workers on farms, especially. My views on how our country is ran legally have completely changed due to the fact that we judge people and convict people for trying to make a living not only for themselves but for their families. I can not believe how far Americans will go out of their way just to detain these immigrants. 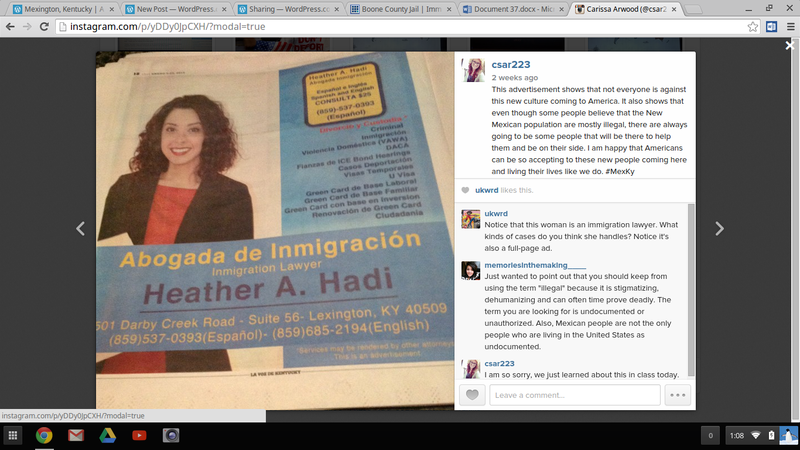 I also found how much these people, undocumented or legal citizens, go through on a daily basis. I have found out that they find the word “illegal immigrant” as dehumanizing and stigmatizing, as shown in the comment below by memoriesinthemaking___. We, as Americans, do not realize the struggle that some people go through just trying to make it through the day. Half of the time, they can barely understand what we say because of the differing languages. We just look over it and do not even try to help. I could not imagine having to live everyday being in complete confusion of the world around me. The simplest things that we do every single day need to be conveyed to others, when sometimes that could be hard to do for these Mexican immigrants. This leads into other struggles that the Mexican population in Lexington deal with on a daily basis; one of which is education. A common struggle that most United States citizens do not understand is those of a student who can not understand a word their teachers or educators are saying during class time. In today’s school systems, more and more students are taught a different language other than English first or speak some other language at home but are basically having to fend for themselves when they go to earn an education. Studies have recently shown that “English is the second language for approximately 5.5 million students in the United States” (Sanchez). With this large of a number of non-English speaking students, you would think that schools would implement some kind of help system. Our schools are being more and more unacceptable with the fact that some children will not understand their educators and often times get angry or upset with the student when they use anything except for English in the classrooms. Instead, these children are getting left behind and forgotten about. They are not being given the same chance as everyone else at continuing their education into college because they can barely speak English. Overall, I have learned a lot about what it is like to live and learn as a Mexican in the United States. I find it sickening that businesses compete on how many undocumented people they can detain. Detainment just does not make sense to me.Too often than not, Americans do not recognize how lucky and blessed we are. Americans do not realize how important getting an education is to most immigrants. I feel like this is something that we, as Americans, take advantage of. We are lucky to be able to sit in a classroom and understand what is being said. Mexington KY has taught me. 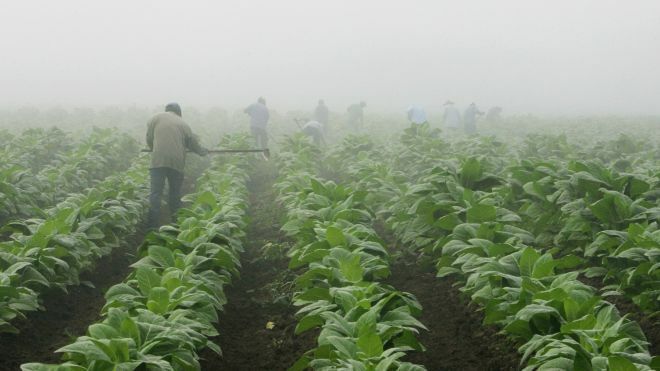 “Report: Children As Young As 7, Many Hispanic, Work On U.S. Tobacco Farms.” Fox News Latino. 14 May 2014. Web. 2 Apr. 2015. Rich, Brian, and Marta Miranda. “The Sociopolitical Dynamics of Mexican Immigration in Lexington, Kentucky, 1997 to 2002: An Ambivalent Community Responds.” New Destinations: Mexican Immigration in the United States. 188. Web. Sanchez, Marcela. “No Spanish-Speaking Child Left Behind.” Washington Post. The Washington Post, 2 Mar. 2007. Web. 3 Mar. 2015. Why is it important for me to learn about Mexington? It is important for me to learn about Mexington because it gives me a chance to almost understand what people go though every day in descrimination. It also lets me find out more about the world I’m living in and what debates or disputes are going on. A common struggle that most United States citizens do not understand is those of a student who can not understand a word their teachers or educators are saying during class time. In today’s school systems, more and more students are taught a different language other than English first or speak some other language at home but are basically having to fend for themselves when they go to earn an education. Studies have recently shown that “English is the second language for approximately 5.5 million students in the United States” (Sanchez). With this large of a number of non-English speaking students, you would think that schools would implement some kind of help system. Instead, these children are getting left behind and forgotten about. They are not being given the same chance as everyone else at continuing their education into college because they can barely speak English. There are quite a few people who believe that these students, who were in fact born and raised in the United States, do no deserve the time or the work that it would take to enhance their knowledge and skills in the English language. Language wars are breaking out all across the United States due to these struggles and obstacles some children have in their path to a better education. The increasing amount of non-English speaking students has created a problem in today’s school systems. In fact, students in today’s educational settings “who speak a language other than English at home are one of the fastest-growing populations” (Armario). These numbers are growing more and more each and everyday, causing educators to have to go out of their way to provide these students with a decent education. The problem is that most teachers and educators just simply put these children on the back burner, so to speak, and concentrate more on the students who they believe will achieve more success in their classrooms. Although some teachers can not help these students who do not speak their language, thereshould be programs in place that can take over and aid to these students who really do need the help. “No hablo Inglés” is all that some of these kindergarten students can say, but no one will help them. Students who come into school speaking a different language should be put into special reading, writing, and speaking classes. They should be worked with every single day and on a learning path to success. Instead, they are being looked over and ignored. If you don’t understand a language, you will be completely confused when having conversations. This happens more often than we think, unfortunately. Although students who do not speak English when coming into school are greatly underestimated, some are willing to do basically anything to succeed. Too often than not, Americans do not recognize how lucky and blessed we are. Americans do not realize how important getting an education is to most immigrants. I feel like this is something that we, as Americans, take advantage of. We are lucky to be able to sit in a classroom and understand what is being said. Armario, Christine. “U.S. Bilingual Education Challenge: Students Learning English As Second Language At Risk.” The Huffington Post. TheHuffingtonPost.com. Web. 3 Mar. 2015. Before entering this course, I did not know much of anything that was going on in the world of immigration and the Mexican population, especially in Lexington, KY. Coming into this class, I knew that in my small hometown of a little over 1,500 people total, the Mexican population consisted of the owners and workers at our local Mexican restaurant. I had no idea what these people went through to get here and how hard life was just living here, even though it is much better than being in Mexico. I did not realize that these people live in fear of being deported everyday of their lives. I honestly had no idea that “detained” was even a word more than less that there are detainment centers for undocumented Immigrants. Here is where I have centered my research, at these detainment centers. During my research, I first found that there is a detainment center in Boone county, about seventy-six miles from Lexington, KY. This is basically a jail where undocumented Immigrants are placed and kept before being deported back to their “homeland.” These people are mothers, fathers, or even children who are just trying to live their lives in the United States of America but are put through a ridiculous amount of discrimination while trying to do what everyone else does. This particular detainment center, according to their website, normally holds “50-60 immigration detainees and around 1,300 ICE detainees; of which 90% are deported and 6% are able to bond out” (“Boone County Jail“). These findings were very surprising to me. Most of these inmates will never see their families or friends again and are losing everything that they worked so hard to achieve. I also found that these jails are located all over the United States of America. According to the American Civil Liberties Union, there are over 250 facilities nationwide with a grand total of 429,000 immigrants detained (“Immigration Detention“). This is heart breaking in my eyes. These people are taken from their spouses, their children, their brothers/sisters, their friends, basically everything that they have ever worked for to be detained. To top all of this off, the detainment centers and our government make money for each and every detainee. We make jobs out of taking other people’s away. We, as Americans, are separating families, friends, and loved ones because we feel as if they do not belong here. We are looking at people and judging them by where they are from, how they were born and punishing them for it. I find it sickening that businesses compete on how many undocumented people they can detain. Detainment just doesn’t make sense to me. I also found how much these people, undocumented or legal citizens, go through on a daily basis. I have found that they find the word “illegal immigrant” as dehumanizing and stigmatizing, as shown in the comment below by memoriesinthemaking___. We, as Americans do not realize the struggle that there people go through just trying to make it through the day. Half of the time, they can barely understand what we say because of the differing languages. We just look over it and do not even try to help. The photo below that I found on Google images really said something to me. I don’t understand why we are so judgmental and not accepting of the Mexican race and why we would take families away from each just because they were not born in the United States. Overall, I find it sickening that businesses compete on how many undocumented people they can detain. Detainment just doesn’t make sense to me. Below is a video with more information about these detainment centers. “Boone County Jail | Immigration Detention Justice Center.” Immigration Detention Justice Center. Web. 6 Feb. 2015. “Gracias Por Una Gran 2014!” La Voz De KY 8 Jan. 2015, 1st ed. : 18. Print. “Immigration Detention.” American Civil Liberties Union. Web. 6 Feb. 2015. “Rare Look Inside a US Immigrant Detention Center (On Assignment 10.24.14).” YouTube. YouTube. Web. 6 Feb. 2015. Before I entered the class entitled Mexington, KY at the University of Kentucky I had never given much thought to the Mexican population of Kentucky. I never really thought there was a difference between Mexicans and Latinos so to help expand my knowledge, I did a little Google searching. I learned that being Mexican is more of a person from Mexico. They have been born and raised there and are most likely living there currently. On the other hand, being Latino is more of a person who is has lived in America for at least six months (I am guessing) but has came from the Mexican culture. I think that the terms Latino and Hispanic are interchangeable and it just depends on the situation on when the proper time to use each term is.